The Biological Fractionation of Isotopes focuses on the biological fractionation of isotopes and presents calculations of the thermodynamic isotopic beta factor for polyatomic carbon compounds. This book provides experimental and theoretical evidence of the phenomenon of thermodynamically ordered distribution of isotopes in biological systems. 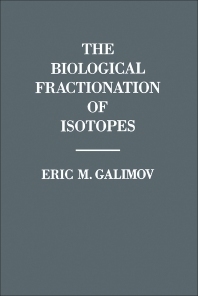 This book consists of 12 chapters and opens with an overview of the causes of fractionation of isotopes, along with concepts such as isotopic composition and isotopic effects. The discussion then turns to the isotopic composition of the carbon of organisms; a method of calculating the thermodynamic isotopic factors of polyatomic compounds; and results of experimental investigations of intermolecular and intramolecular isotopic effects. A theoretical model of biological fractionation of isotopes is also described. The following chapters explore the regularities of the biological distribution of isotopes and present the results of some biochemical experiments, including the enzymatic decarboxylation of pyruvate and microbiological oxidation of ethanol to acetic acid. In addition, the geologic aspects of thermodynamically ordered isotopic distributions in biological products are analyzed. This monograph will be of interest to biologists, geochemists, analytical chemists, and geologists.